My twitter feed alerted me to this supposed sign that Colin Powell is a moonbat. 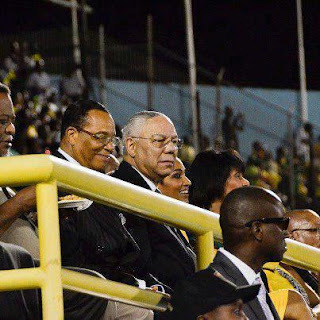 It purports to be a photo of Powell with Louis Farrakhan at the London Olympics, and several bloggers have picked up the story. I'm no great fan of Powell's, but this seems improbable to me. Powell cares too much about his reputation. I am not claiming certainty or expertise, nor do I plan to keep digging around on this, but on a quick internet search, it appears to me that this shot was not taken at the Olympics, but at an event in Jamaica for its 50th Anniversary of Independence (notice that there are no white people at all in what is supposed to be London). Rolling Stone did a photo story on that (and see the 3rd entry here, too), reporting that both men have Jamaican ancestry and were among loads of dignitaries and celebrities invited to Jamaica for the shindig. Perhaps the seats were assigned. At any rate, being at the same event as Farrakhan is not quite the same thing as being so chummy as to travel to the Olympics with him. FWIW.